Sunny apartment with partial sea view from the balcony. Sunny apartment with partial sea view! 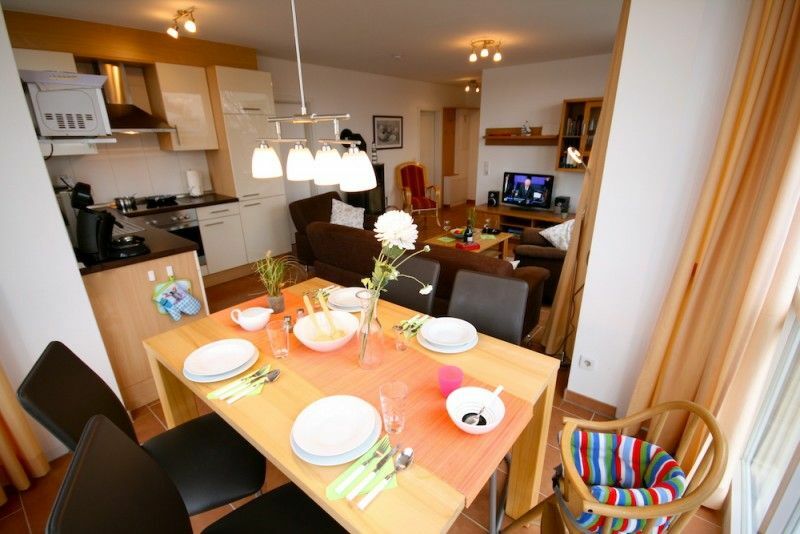 Spend relaxing holidays in our cozy apartment (first time occupancy June 2011) in Strandpark Großenbrode. The spacious living / dining area has a nice sitting area and the dining area is flooded with light through the glass door. The open kitchen is u. a. Fully equipped with dishwasher, ceramic hob, oven, fridge / freezer, microwave and toaster. Two tiled bedrooms, each with a double bed (one of them with additional TV) provide ample space and comfort for 4 people. In the wellness bath with sauna and whirlpool you can relax and end the evening with a glass of wine or tea in front of the fireplace. On warmer days you can enjoy the afternoon and evening sun with a view of the Baltic Sea on our balcony. A high chair, a small footstool in the bathroom, games and books are available. W-LAN is also available and is available to our guests free of charge. A free bike storage room is at your disposal during your vacation. Here you can store your bikes. A wagon is at your disposal for the duration of your holiday in our bike storage room free of charge. The apartment is on the 2nd Floor. The balcony faces south-west. We look forward to welcoming you as guests. A small footstool is available. Our guests can now use a bicycle storage room free of charge! Here you can store your bikes. A wagon is at your disposal for the duration of your holiday in our bike storage room free of charge. In addition to a filter coffee machine, a Senseo coffee pad machine is available. All rooms are equipped with socket fuses. Wir waren wieder Mal für 6 Nächte in Grossenbrode. Wir kennen die Wohnungen im Standpark von 4 früheren Aufenthalten. Die Wohnung "Sonnenschein 24" war genau wie beschrieben und es hat uns sehr gut gefallen. Die Lage ist hervorragend und man hat einen seitlichen Meerblick. Die Ausstattung ist komplett. Besonders möchten wir auch den Service der Objektverwaltering Fr. Timm hervorheben. Bettwäsche, Handtücher und Kaminholz waren wie bestellt geliefert und die Betten schon bezogen. Wir fanden die Matratzen vielleicht etwas hart, aber das ist ja sehr individuell. Wir haben trotzdem sehr gut geschlafen und uns gut erholt. Liebe Familie D., von Ihnen als Stammgast eine tolle Bewertung zu erhalten, freut uns sehr. Es bestätigt uns, bei Ausstattung und Service nicht nachzulassen. Ihr Lob an Frau Timm geben wir selbstverständlich weiter. Steht der nächste Besuch denn schon fest? Wir freuen uns auf Sie! Kaffeemaschine ging kaput und wir haben sofort eine neue vom Vermieter bekommen....super Service. Kommen gerne wieder. Lieber Gast, Danke für Ihre Veröffentlichung. Gern begrüßen wir Sie wieder in Großenbrode. Our new apartment is located in Strandpark Großenbrode, just a few steps from the promenade and the Baltic Sea. Enjoy in every season the fresh Baltic air and the beautiful fine long sandy beach. Restaurants, cafes, bakers and small boutiques invite you to stroll and linger. The marina, countless sports facilities and beautiful playgrounds are on site, Heiligenhafen and the island of Fehmarn are only a few minutes away by car. There you will also find a nice water park. Fun and action can be found in the nearby Hansapark.